Elan Valley Visitor Centre at Elan Valley01597 810880/810898work Visitor CentreThe Elan Valley Visitor Centre is the perfect place to start a visit to the area. The Visitor Centre includes an exhibition (which shows the history and natural history of the area), an audio-visual show, information desk, shop and cafe, toilets, children's play area, cycle hire, large picnic area and a large car and coach parking area. 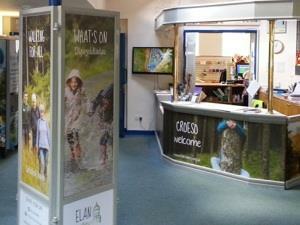 The Elan Valley Visitor Centre is the perfect place to start a visit to the area. The Visitor Centre includes an exhibition (which shows the history and natural history of the area), an audio-visual show, information desk, shop and cafe, toilets, children's play area, cycle hire, large picnic area and a large car and coach parking area. The Visitor Centre provides easy disabled access. Parking £2 - covers you for all car parks all day. Season tickets are also available.